The explainer video aims to demonstrate how we envision the Interactive Transparent Display will work in the ‘Zoo’ and ‘Meeting Room’ scenarios. It will consist of the animations and interface prototypes created by the team members. 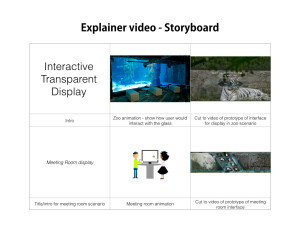 This storyboard provides a general outline of how these artefacts will be put together to create the video.